Thank you Lauren from Manchester! So many thanks to my new friend Lauren, who generously shared cuttings from her American Birch Tree growing in her fantastic habitat garden. Her garden paradise is a pollinator’s dream, filled with gorgeous flowering and fruiting trees and shrubs, native wildflowers, and non-invasive well-behaved ornamental plants. While we were chatting, a Monarch flew on the scene, pausing to nectar at her butterfly bush! Mothra and her siblings thank Lauren, too. Mothra on the move! What a difference – filming Piping Plovers at daybreak, which move like firecrackers, and come home to Mothra , lumbering, in what seems like slow motion. Turn your phone's volume up all the way and you can hear Mothra munching! Many thanks to my new friend Lauren in Manchester for the fresh supply of birch leaves. Mothra and her siblings thank her too. 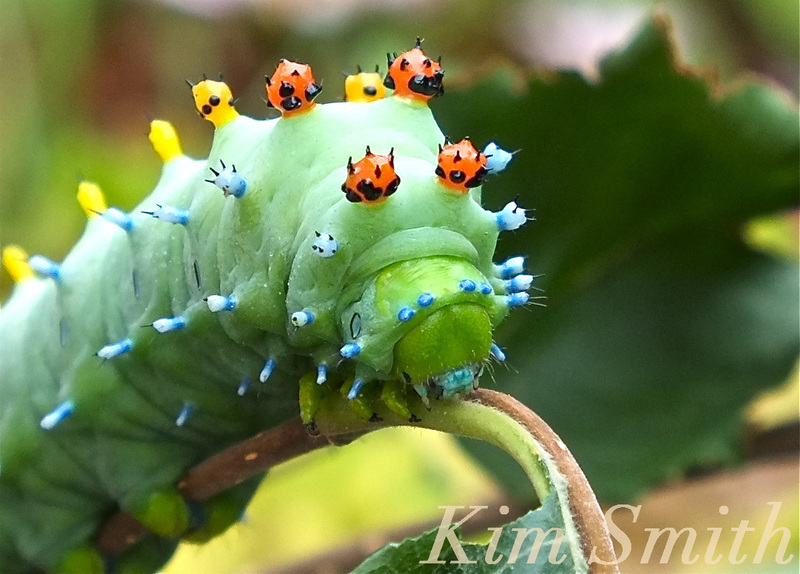 This entry was posted in Lepidoptera and tagged American Birch, Cecropia Moth Caterpillar, cecropia moth caterpillar food plant on August 25, 2016 by Kim Smith.